Enjoying traditional, elegant decor and searching for the perfect storage solution for your big collection of jewelry? Take a look at the Oxford Jewelry Armoire, an innovative jewelry cabinet with a vintage design, meant and designed to store your unique jewelry pieces in one place in a sophisticated way, saving time and energy while dressing up and creating a spectacular accessorizing corner in your home. 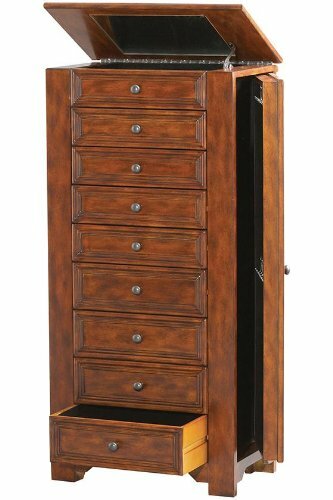 If you are a big jewelry fan and own a big collection and are searching for an optimal and modern storage solution, consider the Oxford Jewelry Armoire. A statement piece for your bedroom, hallway or any other room in your house, that will keep your jewelry well-organized and accessible at any time, while providing a traditional accent to your home decor. Manufactured from the best quality wood in a dark oxford shade which can be easily combined or contrasted with both rustic and modern furniture, the Oxford Jewelry Armoire has different compartments and storage spaces, specially crafted for each type of jewelry you own. It provides eight spacious drawers that come with simple drawer knobs for easy access, two side doors with hooks to hold your necklaces and bracelets, a lift-top storage area with a mirror to instantly check your look while mixing and matching accessories. 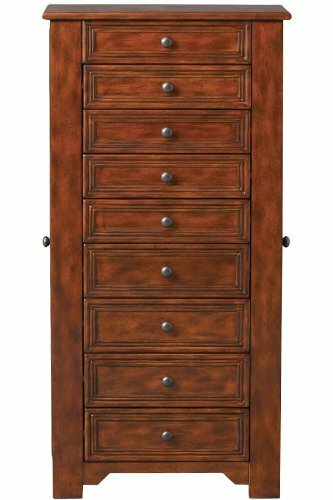 This innovative storage system enveloped in a traditional design, the Oxford Jewelry Armoire will reduce your time spent searching for missing jewelry pieces and will improve your accessorizing corner with its vintage style. The Oxford Jewelry Armoire has 40″H x 20″W x 12″D in size and will perfectly fit any decor at your home or retail store. Specially designed to create a sophisticated atmosphere in your accessorizing spot and to ensure a good maintenance and storage of your valuable and beloved jewelry pieces. This wooden jewelry armoire will become your favorite item of furniture in the house due to its gracious style and utility.